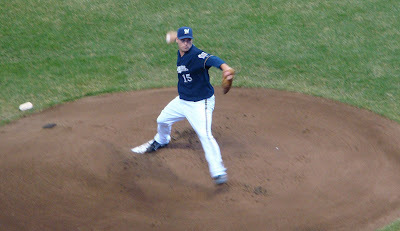 Ben Sheets took all of about three minutes to strike out the side in the first inning en route to his first shutout since his rookie season. Gabe Kapler and Ryan Braun each homered for the second consecutive day as the Brewers methodically pummeled the San Francisco Giants, earning a sweep of the series. Over 44,000 in attendance. I understand the Brewers set a new franchise record for largest opening series attendance. In the 5th inning, Corey Hart singled with two out. He easily stole second, but then J.J. Hardy was intentionally walked to bring up Ben Sheets. I wonder if it would be better to bat Corey Hart 7th instead of Hardy. Hart is about the best base stealer on the team and many of them are going to go wasted if he's batting two spots ahead of the pitcher. The Giants hit two ground-rule doubles to center field. I wondered after each of them if Mike Cameron would have caught them. Kapler wasn't close to either one. All eight of Sheet's strikouts came in the first five innings.